Gordon and apologises as it is just her in the hotel today. Gordon is shown to one of the hotel rooms, he finds a mouldy refrigerator and a rail for a wardrobe. They stayed one night before purchasing the hotel and take him to the dirty room she stayed in. Gordon orders the soup of the day and a fish dish. There is drama and Mandy comes in and explains she is no longer GM, Vanda is a socio path and Rina is never at the hotel. Gordon tastes the soup, it smells burnt, is disgusting and the fish is rock hard. Both Rina and Vanda get snappy and threaten not to pay anyone. Gordon finds Rina in floods of tears with mother Rita who explains that she runs away when things get tough. Gordon speaks to Mandy but the sisters tell her she's not committed and she explodes about working 60 hours a week with two children, gets up and walks out. Gordon tells them that it has been Mandy keeping the place open,that they need to step up and don't deserve to own the hotel. The next morning Gordon heads downstairs to go to the gym and is told to go down the street in his dressing gown! Gordon gathers some of the guests who tell them that the room is run down and neglected and a guest with allergies says her room is caked in dust.Gordon tells Mandy that she is a good GM and asks if she had control would she come back, she says she will think about it. He tells them to bring in someone to manage it or sell it. Gordon calls the staff together and the sister's reveal they are stepping back and Mandy will be running the hotel. The next day Gordon reveals the makeover, the guest rooms are now bright and airy. There are new mattresses and bedding in every room and the rooms have real wardrobes in. Gordon reveals the new gym and new restaurant with recipes provided by Rita, the staff try the food and love it. The sisters struggle to keep their nose out and start interfering, Gordon has to step in and tells them to pack and get out. A taxi arrives for them and Gordon gives them each a goldfish to look after to show they can be responsible, Vanda says she is going to go travelling and Rina cries again. Trip Advisor reviews are mostly good since Gordon's visit but Yelp reviews are mostly negative and mosly after the hotel changed ownership. It was posted on their Facebook Page that their revenue has nearly doubled. Rina and Vanda are no longer the owners of Calumet Inn as of June 2015. Planning a visit to the hotel? Check out their website for further information. 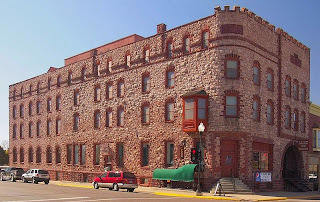 Calumet Inn aired on August 18 2014, the episode was filmed in May 2013 and is Hotel Hell season 2 episode 5. Spoilt and spoiled are both acceptable. Spoilt is more common in British English. I'm not sure that this was a turning moment for dad. This is a guy who has been spoonfeeding his useless daughters for a long time, despite their ineptitude. The first indications would have come over a decade ago when they were emerging as useless teenagers, yet daddy continued writing the checks regardless. It's one thing to view your kids as little princesses, it's quite another to cluelessly fly in the face of every scrap of evidence. They sold the inn. Gordon Ramsay just gave those spoilt brats lots of extra spending money. Say what you want about the girls, but Rina said early in the episode that it was a mistake. it's good that they're out of there, and I do think Gordon's wrath was warrented, but I don't see the point in continuing to brand them spoiled brats. We've all done ventures that we couldn't get out of, this just happened to be a big one for them which unfortunately caught the workers in its spokes. Ultimately, they didn't want to be there but tried to honour their commitments, which is of course hard to do when you don't want to do it anymore. I know folks say "their parents bought it, though" but that's not a good enough reason to say they're spoiled. There are parents who help out their children excessively and it works out just fine, this particular example was just a bad choice, that's all. It happens. Personally, I think the staff were the stars of this episode. Mandy especially. - When she quit, I've never seen an entire workforce gasp like that, it's a sign of just how important she is to them. I don't know if the same staff are still there, I hope so, but I'm glad the girls sold it. It will put it in the hands of someone who hopefully isn't making the same mistake. Please tell me you're joking. Please tell me this comment is sarcasm. You don't see the point in continuing to brand them as spoiled brats? They were 32 and 27. Most of the population has been forced to work for a decade by that point. Rina, the one you're defending, says she "demanded that her daddy" buy this hotel for her and he did. He bought a hotel for her. She had spent one night in this hotel prior. Then, after only 6 weeks after she convinced her daddy to buy her this hotel, this 32-year old woman has the nerve to take 3 MONTHS off to party in Minneapolis and "be alone, and figure things out". They then have the nerve to lounge around and treat this insanely golden opportunity like a playground, completely fail to manage anything, and then blame the innocent and competent staff for the hotel's shortcomings. Talk about disgusting human beings. "Spoiled" is the nicest label a rational person could give to these women. I'd actually rather befriend non-violent convicted felons than these two. You are right about Mandy being the star though. She was the only competent and assertive adult in the hotel, and she called Vandy a "borderline sociopath" and Rina not around her own hotel enough to even make a comment. We all make mistakes, the episode aired like 5 years ago and since changed owners. I can't believe the amount of WHINERS (jealously imo). Just enjoy the episode and let it be a learning lesson for everyone.